After hearing the horrible news on the radio this hero didnt hesitate for a second and he went to rescue his friend which went to the grocery store to grab some goodies. 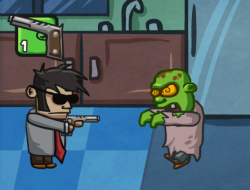 He now has to pass all the zombies that are hungry for brain, but he is only armed with a single gun. You have to help him move up and down in order to aim and then hit the zombies with everything you have got. At the end of each wave of enemies you will get some money with which you can buy some awesome new weapons and also upgrade the ones you have already. Zombie Situation 0.00 between 0 and 10 based on 0 votes.